LONDON — Britain’s defense exports recorded a massive 53 percent uptick in 2017, figures released by the government show. The Defence Security Organisation posted the figures, without any fanfare, on its website at the end of last month, showing British defense companies secured exports valued at £9 billion ($11.59 billion) last year; it’s the second largest annual export success in the last decade. The defense sales figures bounced back from a poor performance in 2016 when associated exports totalled £5.9 billion. “The U.K.’s strong performance equates to a third-placed ranking globally, up from fourth in 2016, and is a considerable achievement,” said the DSO. The British success came against a background of a surge in defense exports globally. The DSO said total overseas sales by countries around the world reached a 10-year high at around $98 billion in 2017. Saudi Arabia, India and Qatar remain the three largest importers of defense equipment, said the DSO. The British government organization said the U.S. dominated international arms exports in 2017 to an extent not seen previously. “In 2017, the USA achieved its highest market-share ever, estimated at 53%, reflecting consistent sales across all sectors. Russian defence exports equated to an estimated market-share of 16%. We estimate the UK market share at 12%, double that of France,” said the DSO. The DSO said the increasing spend on defense exports is a symptom of the rising tensions internationally. Increasingly buyers are getting around financial constraints by raising the money from banks and other off-budget funding sources. “The increased global defense export market total reflects on-going strategic threats/uncertainties and rising prices. Despite fiscal constraints, defence expenditure has been heavily augmented by off budget funding but some projects have been delayed,” said the DSO. The department said the large British upswing in performance from 2016 illustrated the volatile nature of defense exports. Over the last 10 years the best annual defense export effort was in 2013 when sales reached £9.8 billion and the worst was in 2008 when they slumped to £4.3 billion. They also acknowledged that Britain’s almost total reliance on air sector deals exacerbated the sometimes famine-to-feast nature of yearly sales figures. France, Britain’s main European export rival in the sector, was a victim of that volatility last year, securing a single deal for the Dassault Aviation built Rafale fighter, said the DSO. “French defence exports fell sharply in 2017 with only one Rafale deal, their export figures largely comprising helicopter and missile sales,” said the DSO. Export sales by France fell to 6.9 billion euro ($8 billion) last year, pretty much half the previous year’s figure. The DSO, part of the Department for International Trade which was created by the Conservative Government in 2016 to pursue overseas trade opportunities for a post-Brexit Britain, released the defense and security export figures July 31. The DSO leads the government export sales drive in some, but not all, defense equipment areas. The figures show it was not just defense exports that were on the up last year. Security equipment sales in foreign markets also continued to rise in 2017 with the sector recording £4.8 billion in exports, compared to £4.3 billion the previous year. Cyber exports dominated the security sector, being responsible for £1.8 billion of sales overseas last year. That said, as always it was the air sector that generated most of the defense export success. The website listed British equipment sales to the F-35 strike jet program, Rolls-Royce engine sales to the German multi-role tanker transport program and work with Turkey on a possible future fighter project as being among the export successes in 2017. Defense industry executives here said a major five-year deal with Saudi Arabia to support British supplied aircraft operated by the Gulf state was also a factor in the improved export performance in 2017. The Saudi’s operate Typhoon, Tornado and Hawk jets supplied by BAE. British and Saudi governments signed a memorandum of understanding earlier this year on a much-delayed deal to supply a further 48 Typhoon jets to add to the 72 the Gulf state already has in service. The DSO said in its web posting that 91 percent of Britain’s defense exports were accounted for by the air sector. It’s a clear illustration of why the British government launched a combat air strategy at the Farnborough air show in July, including the unveiling of a full-scale concept demonstrator model. 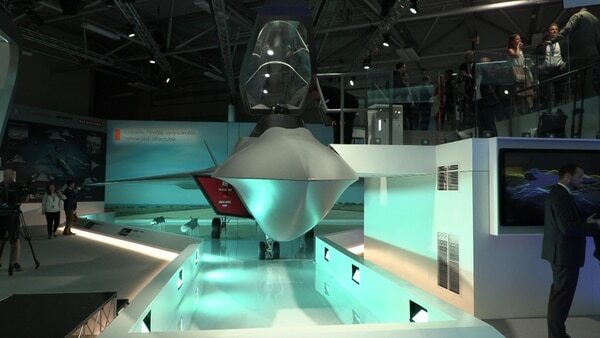 The British government unveiled a full-scale concept demonstrator model of Tempest, its future fighter, at Farnborough. For Britain’s rivals globally the figure attributed to air sector exports is closer to 66 percent. The DSO acknowledged the U.K.’s export effort was unbalanced in favor of air with land accounting for 5 percent and sea just 4 percent of overseas sales. Those naval export figures could change a little for the better this year though. BAE Systems, with its Type 26 anti-submarine warfare frigate design, has recently been selected as the preferred bidder for a multi-billion pound deal with Australia. A contract involving the building of nine warships in Australia could be signed by the end of the year. The Type 26 selection likely boosts the frigates chances of coming out on top in a competition now being run by Canada for a new warship. In fact 2018 could be a bumper year for British defense exports overall. Aside from the likely Type 26 deal with Australia this year the British are also expected to seal a deal with Qatar for 24 Typhoon jets. 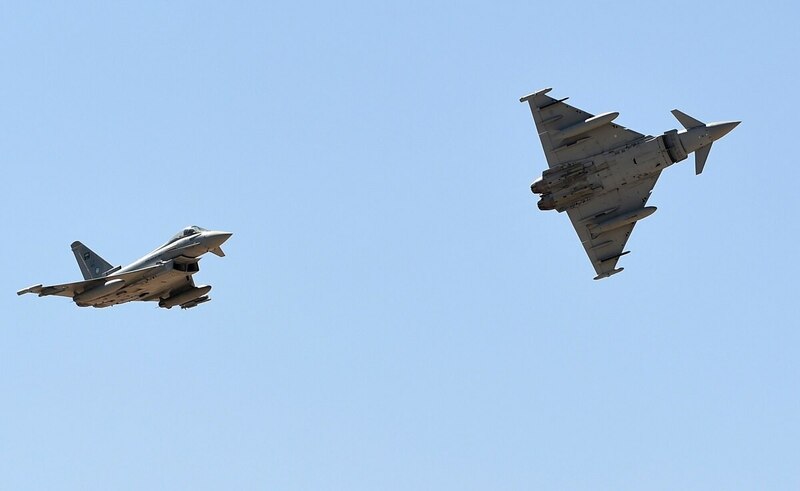 The U.K. and the Gulf state agreed on a deal, and Qatar is currently in the process of raising funds from international banks to finance a multi-billion pound deal for BAE supplied Typhoons along with a handful of Hawk jet trainers.